The origins of the CF-05 submachine-gun are to be tracked back to the mid-1990s, when the PLA launched a request to all Chinese companies for a compact Personal Defense Weapon and combat sub-machinegun that had to fit the needs of non-combatant personnel, the needs of the military personnel which for one reason or another could not carry a bulky and heavy rifle (such as APC or Tank crews, Aircrewmen, pilots, etc. ), and the needs of the Special Forces. The mid-1990s were the time when the Defense and armaments sector in People's Republic of China was liberalized to a partial regime of market economy, with the State not being any longer 100% in control of all the manufacturers of armaments, particularly SALWs (Small Arms and Light Weapons). The very same "historic" Defense industry of China, NORINCO (North China Industries Corporation) became a Joint-Stock Company, open to partial private ownership, and so did China South Industries. Other major defense industries opened, focusing their production upon firearms, and these were 100% in private hands. Between them, there was CHONGQING CHANG-FENG MACHINE MANUFACTURING, Ltd.; it is interesting to know that this is also the industry whom engineered the QSZ-92 9mm pistol that's now becoming the standard sidearm for the People's Liberation Army and the Police forces in China. This weapon is manufactured both by NORINCO, offered for the internal market as the QSZ-92 in both 9x19mm and 5'8mm, and offered for export in the sole 9x19mm caliber as the NP42-M9. CHANG-FENG MACHINE MANUFACTURING Ltd. continues nowadays to produce independently the very same pistol and offer it for export sales under the denomination of CF-98, with a compact version called the CF-07 having been introduced this year (early 2007) and offered for export as well. The PDW caliber chosen since several years now for PLA issue is the .5'8x21mm, a Chinese spawning from the Belgian .5'7x28mm SS-190 cartridge used in the FN P-90 sub-machinegun and "Five-seveN" selfloading pistol. All ballistic datas are the same. In the early years of 21st Century, CHANG-FENG Ltd. submitted the first .5'8mm competitor to the trial called the CFQ. The year was around 2001. The weapon was blow-back operated, and had double-feeding possibility. The main feeding came from a helical 50-rounds magazine located on top of the receiver between the rear and fore-sight, similar in design to the magazine of the U.S.-made CALICO sub-machineguns system. Early prototypes (also called "Generation 1" also had a second feed option in the form of a 12-rounds magazine to be located inside the grip, similarly to a pistol or a standard sub-machinegun. The magazines it took in this way were the same of the .5'8x21mm QSZ-92 pistol for Special Forces. 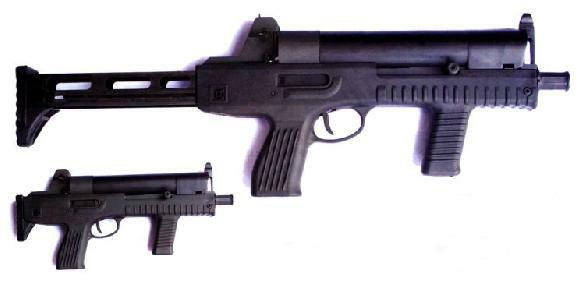 In this phase, the weapon was also purported to be convertible for the 9x19mm caliber and to take 9mm QSZ-92 magazines; this would have made it viable not only for PLA Special Forces (whose sidearm, sub-machinegun and PDW caliber was to become .5'8x21mm), but also for the Police and the regular Armed Forces (which would have instead got the .9x19mm). However, the dual-feed system was deemed overly complex and unnecessary, so on the production version the grip magazine was removed. 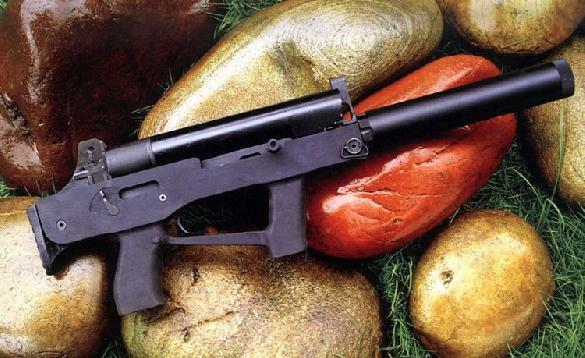 However, the weapon lost the bid for the PLA’s next generation submachine gun contract to the Jianshe Group QCW05 in 2001, partially due to its overly complicated design. Since then, CHANG-FENG Ltd. has developed the submachine-gun into the CF-05 9x19mm personal defence weapon (PDW) for police force and commercial export market. Already from the 2005/2006 advanced prototype (Generation 2) notable changes had appeared. First of all, in coincidence with the year (2005), the weapon had changed denomination from the original prototype name (CFQ) to the current one (CF-05). 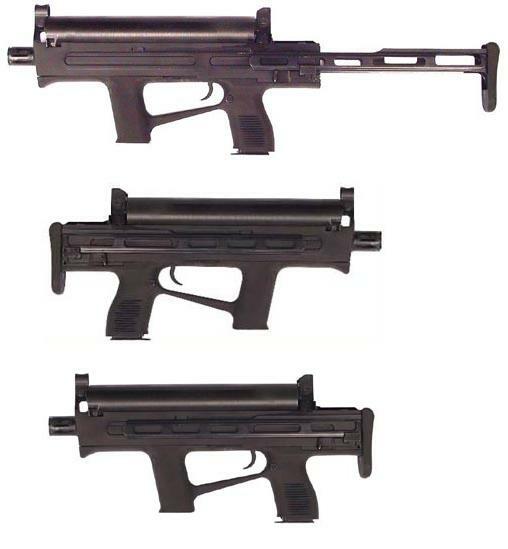 The frame and grip design had changed severely from the original project (which was very similar to the PLA new standard QBZ-95 bull-pup assault rifle), the caliber had been converted to 9x19mm only, and the helical magazine was made of transparent plastic so that the number of rounds left was clearly visible. The working system remained the same blowback-operated, with an ejection port located on the right side of the weapon, as well as the cocking lever and the safety/fire selector switch as well. The weapon is fitted with open sights, and has a mounting point for a proprietary 1,5x red-dot optical sight or night sight just behind the rear sight block, while a ring-mount to be installed at the muzzle works as an adapter for a tandem visible red-light laser beamsight/LED tactical light; a proprietary quick-attach/detach sound suppressor was also made, all of these features being offsprings from the original PLA PDW trial requirements. The frame of the weapon is made out of polymer, this ensuring a thorough weight reducing which combines to a very slow rate of fire (around 400 Rounds Per Minute) for excellent controllability during full-automatic fire and zero recoil felt in semi-automatic mode. The polymer stock is swiveling-collapsible, and can be retracted inside the frame of the weapon when compactness is required for extreme Close-Quarters use (such as from inside a vehicle), or for concealed carry. In the early year 2007, the Generation 3 model was introduced in several defense expos in Asia and Eastern Europe, notaby the 2nd CIPATE - China International Exhibition and Symposium on Police Equipment and Anti-Terrorism Technology and Equipment (Beijing Exhibition Centre, May 17-19, 2007). The Gen3 should represent the final development and the definitive production phase model for the CF-05 sub-machinegun. All the features of the Generation 2 model were retained, but the design of the frame was a bit modified to make it more "gripping" in conditions when a weapon with smooth grips could easily slip off the hands of the user (i.e. wet gloves or sweaty hands). Plus, in the Gen3 the safety/fire selector switch has been moved on the left side of the frame, with the ejection port remaining on the right. 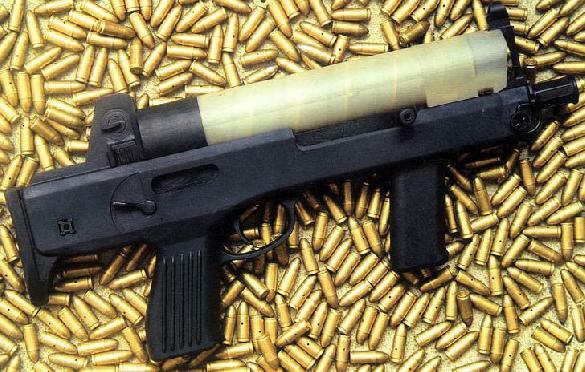 Also, the available pictures of Gen3 CF-05 sub-machinegun feature a helical magazine that isn't any longer made of transparent plastic, although such design would allow quick check of remaining ammunition, an undoubtable advantage to the user that is hardly believable to have been shelved. 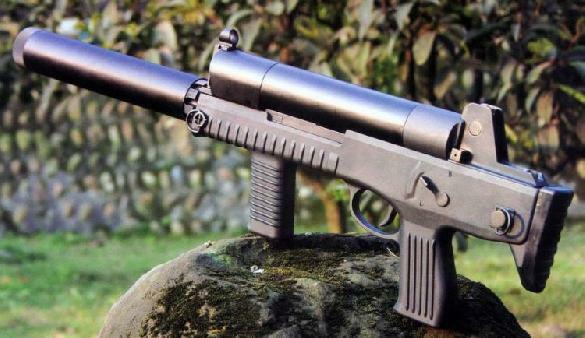 As for early 2007, the CF-05 is listed as the "9mm Sub-machine gun" in the NORINCO website, offered for sale by them. It should be noted by the way that NORINCO and CHANG-FENG Ltd. are not the same company and aren't tied in any way, so we should assume that the two companies only share a marketing agreement for the export of this weapon. The picture of the CF-05 as displayed on the NORINCO website is the one of a Generation 2 model, so is unclear whether the agreement will ultimately lead NORINCO to market worldwide the definitive version of the CF-05. -TECHNICAL SPECS- CALIBER: 9x19mm (a.k.a. 9 m/m "Luger" - "Parabellum" - "NATO") CAPACITY: 50 rounds in top-mounted helical magazine OPERATION: Gas blowback, select-fire, closed bolt OVERALL LENGHT: 598 Millimetres with stock extended; 405 Millimetres with stock retracted BARREL LENGHT: 250 Millimetres WEIGHT: 2,1 Kilograms loaded; 1,9 Kilograms unloaded RATE OF FIRE: 400 Rounds per minute -MANUFACTURER CONTACT INFO- Chongqing Chang-Feng Machine Manufacturing, Ltd. Economic & Techonology Development Area, Longyan, Fujian 364012 - People's Republic of China TEL: 05972791829 -EXPORTER CONTACT INFO- NORINCO Equipment Co., Ltd. 12A Guang-An-Men Nan-Jie Beijing P.O. Box 2932 - Beijing 100053 - People's Republic of China TEL: (8610) 63542729 - 83919259 FAX: (8610) 83546306 URL: http://www.norincoequipment.cn E-MAIL: equipment@norinco.com.cn CF-05 sub-machinegun "Generation 1" prototype, also known as the CFQ. Early pictures from the PLA Personal Defense Weapon trial of early 2000s. Note the collapsible stock swiveling outside of the frame and the dual-feeding system (a magazine is evidently mounted inside the grip). It should also be noted anyway that this picture doesn't shows signs of cocking handle, ejection port or safety/fire selector switch. Possibly a mock-up. CF-05 sub-machinegun "Generation 1" prototype, also known as the CFQ. Early pictures from the PLA Personal Defense Weapon trial of early 2000s (source: Chinese press). This picture portrays a fully functional prototype. The swiveling stock collapses inside the frame of the weapon, ejection port and safety/selector switch are both fully visible. The weapon is equipped with sound suppressor. The dual-feeding system (grip magazine) seems to have already disappeared. CF-05 sub-machinegun "Generation 2" advanced stage, the denomination of CF-05 becoming finally official. Overall firearm design has thoroughly changed. CF-05 sub-machinegun "Generation 2" advanced stage, the denomination of CF-05 becoming finally official. The weapon is equipped with screw-on sound suppressor and red-dot optical sight. CF-05 sub-machinegun "Generation 2" advanced stage, the denomination of CF-05 becoming finally official. The weapon is equipped with red-dot optical sight and muzzle mount for tactical accessories. CF-05 sub-machinegun "Generation 3" final design with modified frame. Right side view, with stock both open and collapsed. Notice that the helical feeding magazine isn't made of translucent plastic any longer, and that the safety/fire selector switch doesn't appears anymore on the right side of the frame. CF-05 sub-machinegun "Generation 3" final design with modified frame. Left side view, equipped with screw-on proprietary sound suppressor. Notice that the safety/fire selector switch now appears on the left side of the frame only.